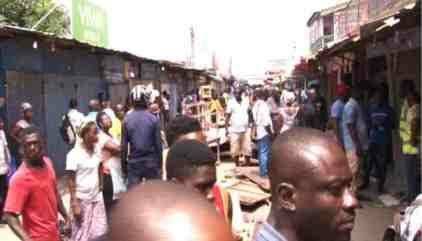 “Regrettably on Saturday, Sept. 22, one of our female members, Mrs Stella Ogonna Okpaleke, whose shop has been under lock and key by the Ghana authority committed suicide. She committed suicide based on her shop and that of her husband that were locked. The information we gathered was that when they locked the shop, she lost hope of reopening it. She is from Nnewi Local Government (Area) in Anambra. We actually don’t know how much she owed, but we learnt that she took loan for her business,” he said. “I am just going to start by appealing to you, I know it is painful, it is emotional, it is deep but I just urge you to remain calm. I appeal to you to remain calm and may the soul of Stella rest in perfect peace. When she is about to be buried, let us know so that we may send our condolence message to the family,” she said.